Sunday mornings over at That’s My Home and Recipes, Food and Cooking, I usually make muffins or pancakes. 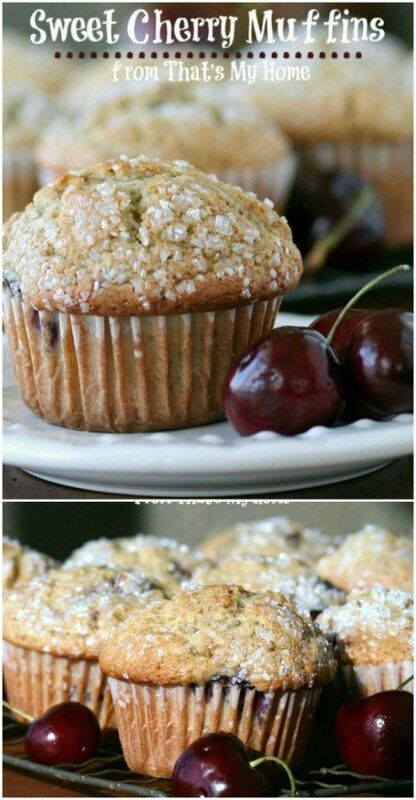 The sweet cherries are so good this year that I really wanted to make some muffins with them. I think the best way to enjoy these cherries is right out of the bag but I had to bake with some just because I could. The cherries added a nice flavor to these buttermilk muffins and everyone loved the crunch of the sugar on top. Visiting from Time to Sparkle link party. These look delicious, they look like they’ve just come from a bakery. I co-host Sweet and Savoury Sunday and would love for you to stop by and share this and other recipes with us. Have a great day! These look fantastic! I just bought a cherry pitter last week and love muffins. Pinned these so I can try them. Visiting from SITS.